The area of our Prudden Conservation Easement, which was illegally clearcut last fall (Oct. 2017), continues to be restored. The land trust is committed to assuring the land is renovated and intends to stay involved along every step of the way. We’ll continue to provide updates as the renovation proceeds. Update: The area was converted into rough pasture near the end of 2018, with additional improvements made in November 2018 and March 2019 (see below). Chronology: The Harwinton Land Trust was deeply saddened by last year’s illegal clearcut on its conservation easement along upper Leadmine Brook Road. This conservation easement was given to the Land Trust by long-time residents, Betsy and Peter Prudden, in 1999. 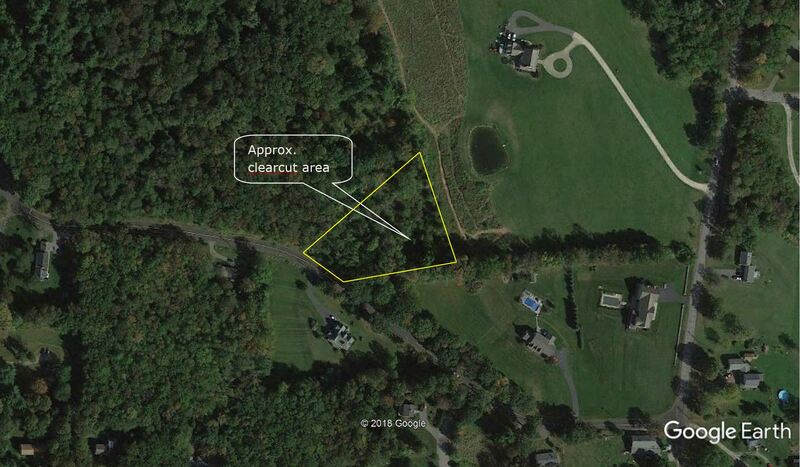 The 92-acre easement (56 acres east of North Rd., along upper Leadmine Brook Rd.) was donated to the Land Trust in order protect its agricultural and forested lands. Although the Trust does not actually own the property, the conservation easement obligates us to protect the land against development. For nearly 20 years, the Trust has been diligent in its stewardship of the easement and performed formal inspections each year to ensure that the required land protections were being adhered to by the property owners. During those years, the land remained protected, provided environmental benefits, and added to the rural character of our town. Needless to say, it was a shock to find that a large forested area of our easement had been completely leveled within a day (Oct. 19, 2017) by heavy land clearing equipment. All of this was done without the knowledge or consent of the land owner. 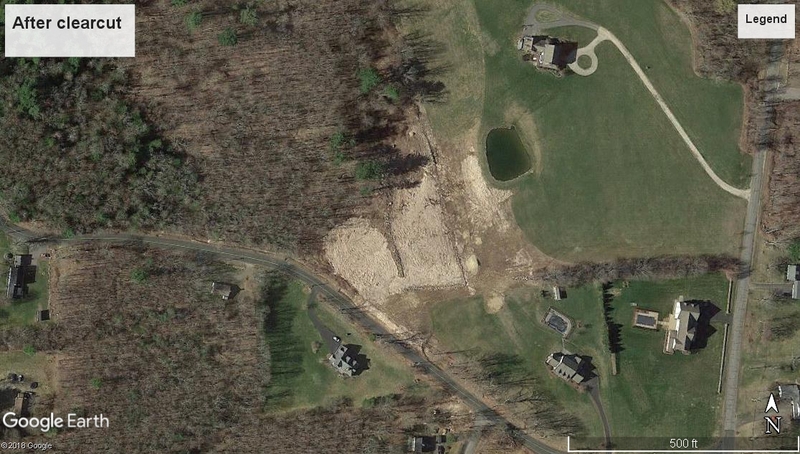 Location of the forested area that was clearcut adjacent to Leadmine Brook Rd. The Trust’s Board of Directors convened immediately after the event to determine a course of action. We understood the importance of this property to so many fellow Harwintonians, and were committed to restoring the area. Our first steps were to hire a surveyor and consult with a certified forester to begin the process of defining an approach to remediation. The surveyor determined the clearcut to be even larger (~2 acres) than first estimated (~1 acre). Thus, work to restore the area would be even more difficult than originally thought. The certified forester indicated that reforestation was possible, but that long-term efforts would be necessary to prevent invasives (multiflora rose and bittersweet vines) from overwhelming any trees that were planted or sprouted from stumps. Given that the Trust does not actually own the land, it could not make a long-term commitment for controlling invasives through the use of herbicides or continual brush cutting. Further, stumps that had been buried under a heavy blanket of wood chips would hinder the sprouting of new trees. 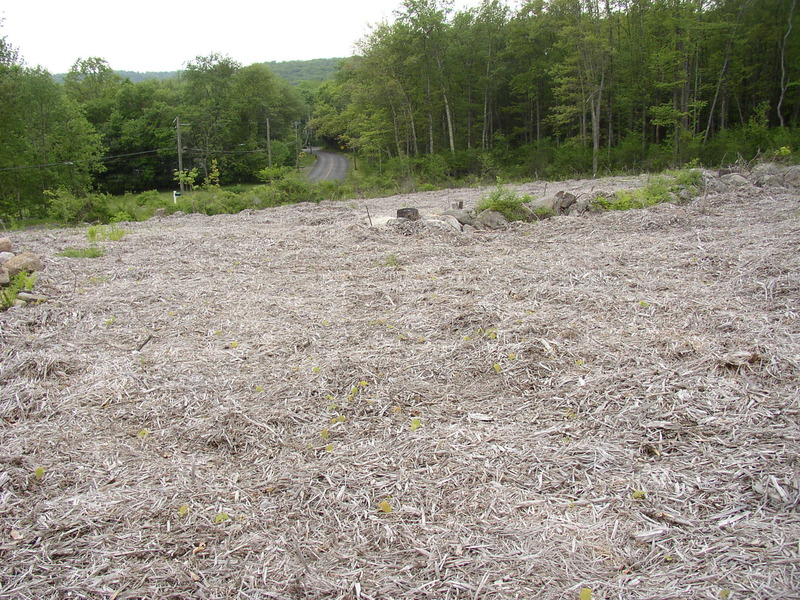 Given the abundance of on-site invasives, the clearcut area would likely turn into old field habitat. Although old field habitat (generally a thicket of pricker bushes) may be good for cottontail rabbits and song birds, it would be unsightly and not conform to the rural character of the area. Reforestation was given strong consideration by the Board of Directors, since our conservation easement led it in that direction. However, reforestation did not appear to be a viable option given the long-term management needs. The Trust then considered other options, including conversion to agricultural use, as that use is also allowed under the conservation easement. 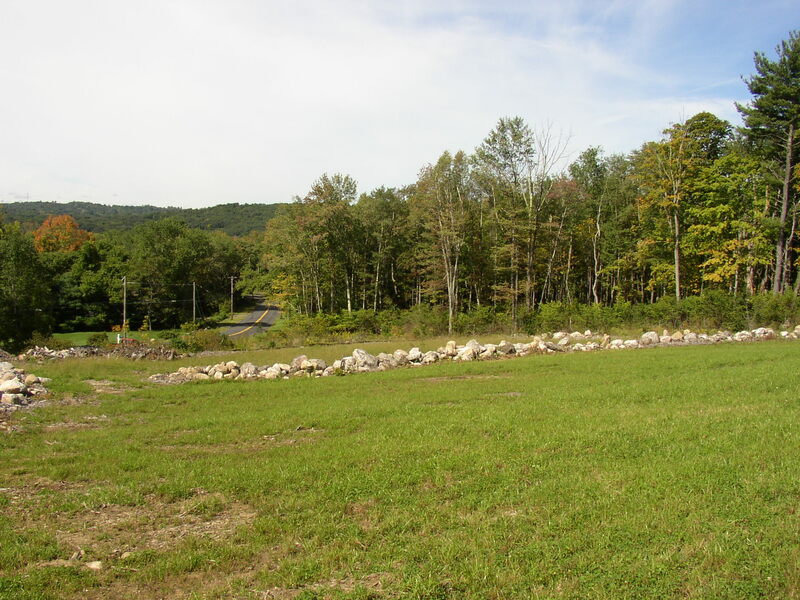 Possible agricultural conversions included, an apple orchard, a vineyard, and a hay field. Also considered was a pollinator field, which would essentially be a field of milkweed and wild flowers used by bees and butterflies. This option would provide environmental benefits, especially for the threatened Monarch butterfly. All of these uses would require long term management and would pose unreasonable burdens on current and future land owners, who might not have the ability to maintain these specialized areas. As with reforestation, these options did not seem feasible. A land trust Prudden remediation committee then met with the land owner and the person who did the clearcutting. The person who did the clearcutting is a neighbor and owner of a land clearing business. He acknowledged that he made a serious mistake and indicated that he would commit to renovating the land at his cost. Reforestation and the agricultural/environmental options mentioned above were discussed and dismissed as not being feasible. Discussions then led to the option of creating and maintaining the area as a pasture. It should be noted that the clear cut area had previously been a pasture into the 1960s and that the Pruddens occasionally had cows there. As of late-May, no sprouting of trees was observed. Multiflora rose was the only woody vegetation growing up through the thick covering of wood chips. As suspected, reforestation under these conditions would be difficult to achieve. Clearcut blanketed in wood chips, with no small trees sprouting from buried stumps. (Top of hill looking down on Leadmine Brook Rd., May 26, 2018). Work to renovate the clearcut began in mid May. 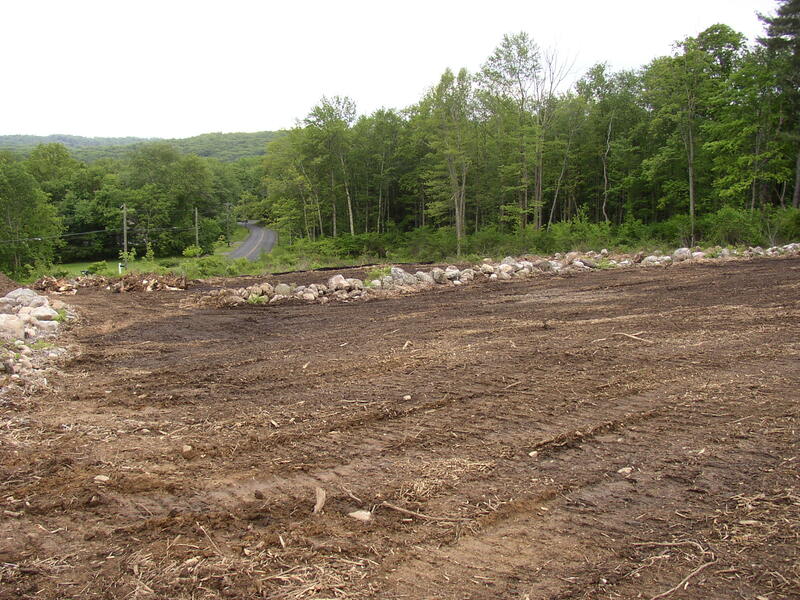 Clearing started at the top of the clearcut, where the soil was dry and less likely to erode. 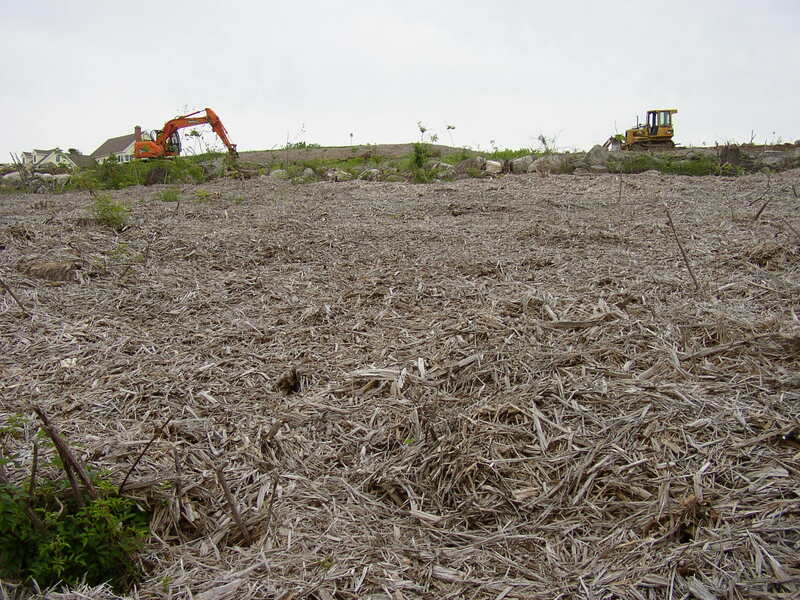 Wood chips and stumps were removed in an approximate 50-swath along the entire upper (north) border of the clearcut. Swath of cleared land at the upper section of the clearcut, May 26, 2018. 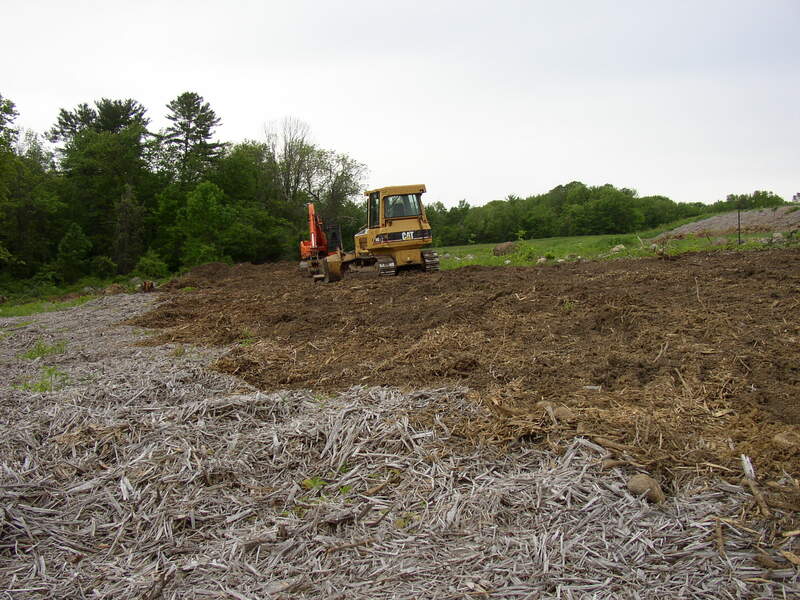 By June 4, wood chips and stumps within the entire clearcut area had been removed. The entire area was graded and the drier upper section was seeded. By June 9, the entire area appeared to be seeded. The owner of the land clearing business completed this phase of work as he had agreed to do with the Land Trust. 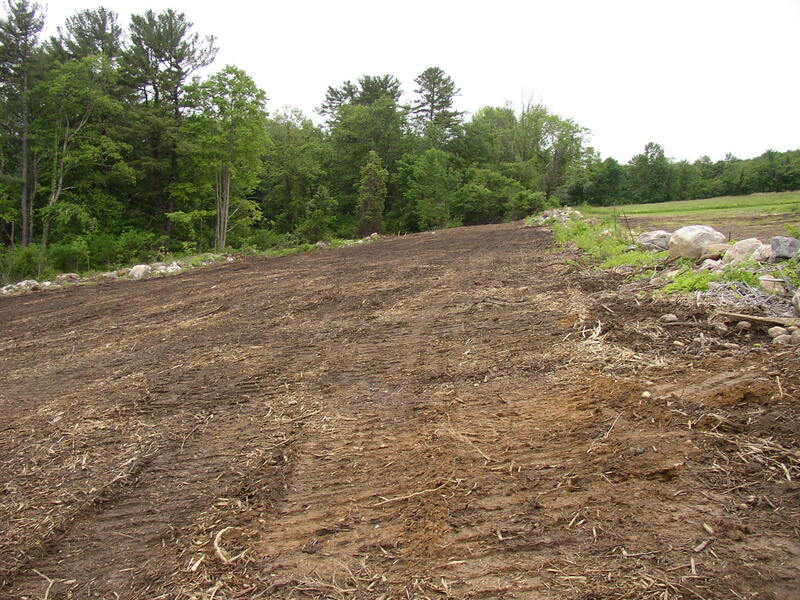 Upper section of the clearcut was graded and seeded by June 4, 2018 (compare with photo directly above). The entire area, above and below the partial rock wall, had been cleared of wood chips, stumps and was graded as of June 4, 2018. Note the silt fence at the lower right of cleared area and the pile of stumps in the lower left. Photo taken at the top NE corner of clearcut. By Sept. 2018, the area has grown into a rough pasture. Some areas will need more grading and reseeding, but no multiflora rose or bittersweet vines were present. The area has taken on a more aesthetic appearance. Piles of chips, stumps, boulders piled next to the road will have to be removed. Next spring, hemlocks will be planted along the road, and a group of several hardwoods will be planted in the middle of the pasture. Clearcut area now a rough pasture (9/17/18). Compare with photo above. On Nov. 15, 2018 the pile of mulch was graded into a swale that will resolve drainage issues onto Leadmine Brook Rd. The mulch was also smoothed-over on the neighboring property. 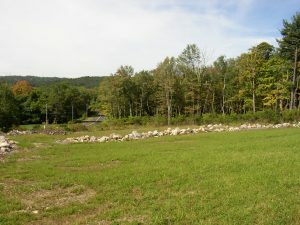 The stumps piled along the road were removed, and the pile of boulders were moved from roadside to existing stone walls. The walls will be improved by refitting the rocks. The area looks better now that the piles have been taken care of. 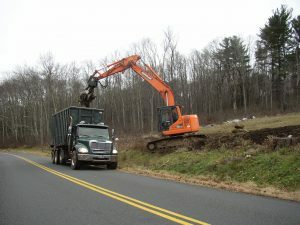 Next spring, plans call for planting evergreens along the road and adding top soil to rough areas in the lower pasture. Stumps piled alongside the road were removed from the clearcut site. On March 13, 2019, some additional improvements were made, including adding top soil to an area in the lower pasture and adding a row fresh bark mulch at the bottom edge of the lower pasture to contain runoff.